Just thought id share this similar test to neo-pi big 5 test i found that gives not only the big 5 dimensions, but also 6 facets to each of the dimensions. Be aware that it has around 300 questions, so its a pretty long test. You prefer very low levels of activity, such as being on the go and staying busy. There're about average chances that you'll take charge and lead others. You experience low levels of happiness, joy, and other positive emotions. You like to seek very low levels of thrills. You're about average in your desire to be around other people and show an interest in their lives. You're about average in flocking toward other people and being talkative and sociable around them. You are low in generally wanting to be good to other people, including helping them when they need it. There are about average chances that you'll try to get along with other people. You have about average levels of modesty. Modest people don't like to brag or show off, because those types of behaviors can be harmful to relationships. Sticking to the rules and treating everyone fairly is of about average value to you. You have high levels of sympathy for other people, which includes caring about them and wanting what's best for them. You're about average in believing that other people are generally good and not out to harm you. You have extremely low desires to work hard and get ahead. The odds are about average that you'll just jump into things without really thinking them through. You spend about average amounts of time planning what to do. You're low in sticking to your word, keeping your promises, and upholding your obligations. You prefer extremely low levels of cleanliness and order in your environment. You have extremely low self-discipline—which is the ability to get to work quickly, stay focused, and avoid distractions or procrastination. When you need to do something, you have very high ability to get it done and do it well (or maybe more accurately, you believe that your ability is very high). 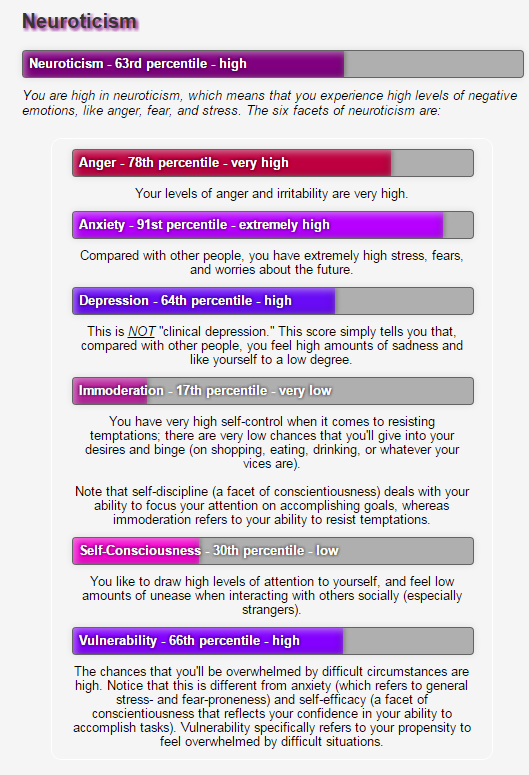 Your levels of anger and irritability are very low. Compared with other people, you have very low stress, fears, and worries about the future. This is NOT "clinical depression." This score simply tells you that, compared with other people, you feel low amounts of sadness and like yourself to a high degree. You have about average self-control when it comes to resisting temptations; there are about average chances that you'll give into your desires and binge (on shopping, eating, drinking, or whatever your vices are). Note that self-discipline (a facet of conscientiousness) deals with your ability to focus your attention on accomplishing goals, whereas immoderation refers to your ability to resist temptations. You like to draw about average levels of attention to yourself, and feel about average amounts of unease when interacting with others socially (especially strangers). The chances that you'll be overwhelmed by difficult circumstances are very low. Notice that this is different from anxiety (which refers to general stress- and fear-proneness) and self-efficacy (a facet of conscientiousness that reflects your confidence in your ability to accomplish tasks). Vulnerability specifically refers to your propensity to feel overwhelmed by difficult situations. Your prefer very high amounts of variety and new experiences in your life (i.e., you have very high openness to new experiences). You have high love for art, music, and culture (i.e., you have high openness to aesthetic experiences). Your attunement to your own and others' emotions is about average. Whereas cheerfulness and excitement seeking (facets of extraversion) capture your propensity to feel positive emotions and neuroticism captures your propensity to feel negative emotions, emotionality refers to your overall openness to/desire to truly feel emotions. You have extremely high imagination (i.e., you have extremely high openness to experiences of the imagination). Your desire to play with ideas, reflect on philosophical concepts, and have deep discussions is extremely high (i.e., you have extremely high openness to intellectual experiences). Your political liberalism is extremely high (conversely, your political conservatism is extremely low). This is a facet of openness to experience because liberals tend to desire progressive change, whereas conservatives tend to prefer less political change. I dont 100% agree with all of the results, but it definitely gives much better view on personality than the early version of big 5. I'm not even going to share this. 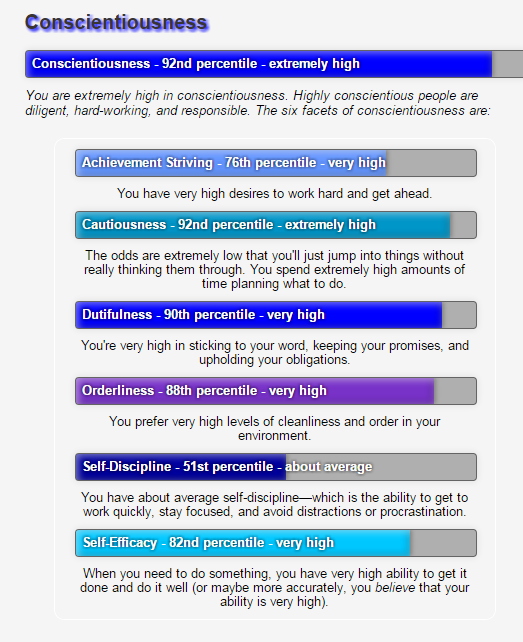 My neuroticism is absurdly high. There're extremely low chances that you'll take charge and lead others. You experience high levels of happiness, joy, and other positive emotions. You like to seek very high levels of thrills. You're very low in your desire to be around other people and show an interest in their lives. You are extremely low in generally wanting to be good to other people, including helping them when they need it. There are very low chances that you'll try to get along with other people. You have high levels of modesty. Modest people don't like to brag or show off, because those types of behaviors can be harmful to relationships. Sticking to the rules and treating everyone fairly is of extremely low value to you. You're very low in believing that other people are generally good and not out to harm you. The odds are very high that you'll just jump into things without really thinking them through. You spend very low amounts of time planning what to do. When you need to do something, you have about average ability to get it done and do it well (or maybe more accurately, you believe that your ability is about average). Your levels of anger and irritability are high. Compared with other people, you have high stress, fears, and worries about the future. This is NOT "clinical depression." This score simply tells you that, compared with other people, you feel extremely high amounts of sadness and like yourself to a extremely low degree. You have extremely low self-control when it comes to resisting temptations; there are very high chances that you'll give into your desires and binge (on shopping, eating, drinking, or whatever your vices are). You like to draw very low levels of attention to yourself, and feel very high amounts of unease when interacting with others socially (especially strangers). The chances that you'll be overwhelmed by difficult circumstances are high. Notice that this is different from anxiety (which refers to general stress- and fear-proneness) and self-efficacy (a facet of conscientiousness that reflects your confidence in your ability to accomplish tasks). Vulnerability specifically refers to your propensity to feel overwhelmed by difficult situations. Your prefer extremely high amounts of variety and new experiences in your life (i.e., you have extremely high openness to new experiences). Your attunement to your own and others' emotions is high. Whereas cheerfulness and excitement seeking (facets of extraversion) capture your propensity to feel positive emotions and neuroticism captures your propensity to feel negative emotions, emotionality refers to your overall openness to/desire to truly feel emotions. You have very high imagination (i.e., you have very high openness to experiences of the imagination). Your desire to play with ideas, reflect on philosophical concepts, and have deep discussions is high (i.e., you have high openness to intellectual experiences). The Big Five personality dimensions are broad personality traits that describe the majority of ways that people can differ from each other. What does this mean? Each of the Big-Five personality dimensions contains several smaller "facets." What is a facet? There're low chances that you'll take charge and lead others. You like to seek high levels of thrills. You're extremely low in your desire to be around other people and show an interest in their lives. You're very low in flocking toward other people and being talkative and sociable around them. Extraversion score not equal to the average of its facets? You are very low in generally wanting to be good to other people, including helping them when they need it. There are low chances that you'll try to get along with other people. You have very low levels of modesty. Modest people don't like to brag or show off, because those types of behaviors can be harmful to relationships. Sticking to the rules and treating everyone fairly is of low value to you. You have about average levels of sympathy for other people, which includes caring about them and wanting what's best for them. You're about average in sticking to your word, keeping your promises, and upholding your obligations. When you need to do something, you have high ability to get it done and do it well (or maybe more accurately, you believe that your ability is high). Your levels of anger and irritability are about average. You have high self-control when it comes to resisting temptations; there are low chances that you'll give into your desires and binge (on shopping, eating, drinking, or whatever your vices are). You like to draw high levels of attention to yourself, and feel low amounts of unease when interacting with others socially (especially strangers). You have very high love for art, music, and culture (i.e., you have very high openness to aesthetic experiences). Yay! I decreased my neuroticism! Also, I think I've become less modest. Whatever. Regarding politics, the religion I was raised in was "Democrat." There're very low chances that you'll take charge and lead others. You experience extremely low levels of happiness, joy, and other positive emotions. You like to seek about average levels of thrills. You're extremely low in flocking toward other people and being talkative and sociable around them. There are extremely low chances that you'll try to get along with other people. You have very high levels of modesty. Modest people don't like to brag or show off, because those types of behaviors can be harmful to relationships. You're low in believing that other people are generally good and not out to harm you. You're very low in sticking to your word, keeping your promises, and upholding your obligations. When you need to do something, you have low ability to get it done and do it well (or maybe more accurately, you believe that your ability is low). Compared with other people, you have low stress, fears, and worries about the future. You have low self-control when it comes to resisting temptations; there are high chances that you'll give into your desires and binge (on shopping, eating, drinking, or whatever your vices are). Your attunement to your own and others' emotions is very high. Whereas cheerfulness and excitement seeking (facets of extraversion) capture your propensity to feel positive emotions and neuroticism captures your propensity to feel negative emotions, emotionality refers to your overall openness to/desire to truly feel emotions. Your desire to play with ideas, reflect on philosophical concepts, and have deep discussions is very high (i.e., you have very high openness to intellectual experiences). Your political liberalism is very high (conversely, your political conservatism is very low). This is a facet of openness to experience because liberals tend to desire progressive change, whereas conservatives tend to prefer less political change. 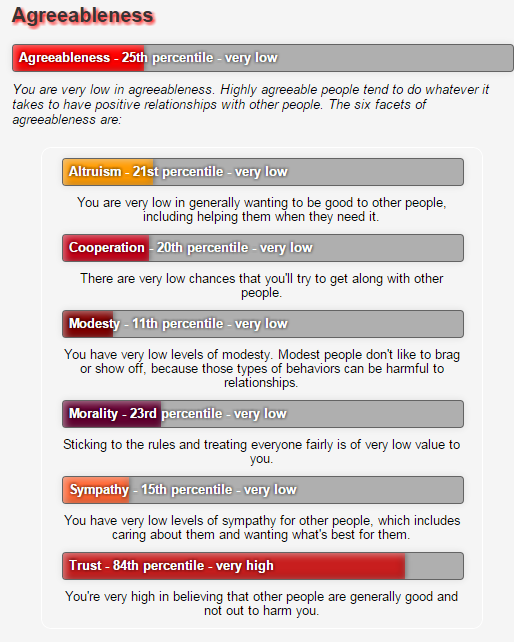 The only part I am surprised about is how low my agreeableness is. I generally see myself as pretty agreeable? Maybe it's because I answered how I honestly feel most of the time, but not how I react (those are often rather different). 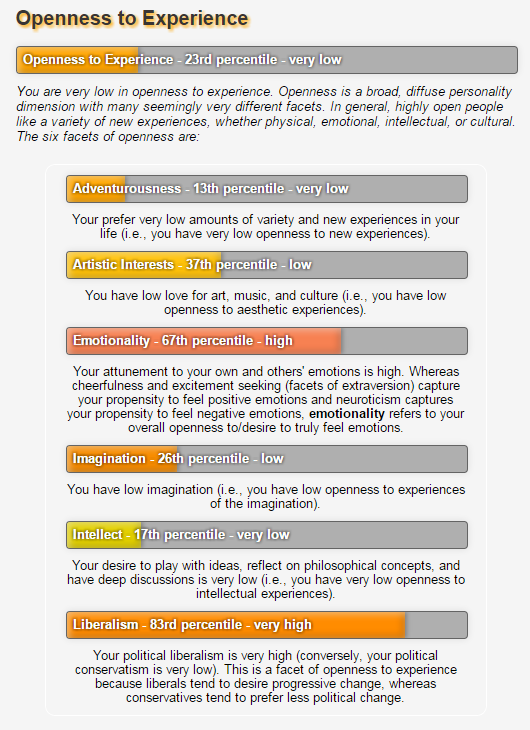 Kind of surprised at the lowness of the extroversion, but after reading the "in-depth" results I understand why. I'm not "assertive" or "excitement-seeking" at all. I buckled in for a wild ride. I think many of these scores are exaggerated, but the gist is about right. You prefer about average levels of activity, such as being on the go and staying busy. There're high chances that you'll take charge and lead others. You experience about average levels of happiness, joy, and other positive emotions. You are high in generally wanting to be good to other people, including helping them when they need it. Sticking to the rules and treating everyone fairly is of very low value to you. You're extremely high in believing that other people are generally good and not out to harm you. You have very high desires to work hard and get ahead. The odds are very low that you'll just jump into things without really thinking them through. You spend very high amounts of time planning what to do. You're high in sticking to your word, keeping your promises, and upholding your obligations. You prefer very high levels of cleanliness and order in your environment. You have very high self-discipline—which is the ability to get to work quickly, stay focused, and avoid distractions or procrastination. When you need to do something, you have extremely high ability to get it done and do it well (or maybe more accurately, you believe that your ability is extremely high). Compared with other people, you have extremely low stress, fears, and worries about the future. You have extremely high self-control when it comes to resisting temptations; there are extremely low chances that you'll give into your desires and binge (on shopping, eating, drinking, or whatever your vices are). The chances that you'll be overwhelmed by difficult circumstances are extremely low. Notice that this is different from anxiety (which refers to general stress- and fear-proneness) and self-efficacy (a facet of conscientiousness that reflects your confidence in your ability to accomplish tasks). Vulnerability specifically refers to your propensity to feel overwhelmed by difficult situations. Your attunement to your own and others' emotions is low. Whereas cheerfulness and excitement seeking (facets of extraversion) capture your propensity to feel positive emotions and neuroticism captures your propensity to feel negative emotions, emotionality refers to your overall openness to/desire to truly feel emotions. Perhaps absurdly high is higher than extremely high, but without confirmation I must assume I won. Just look at that bar. It's almost completely purple. Go me! You prefer extremely low levels of activity, such as being on the go and staying busy. You experience very low levels of happiness, joy, and other positive emotions. You like to seek low levels of thrills. You're low in your desire to be around other people and show an interest in their lives. You're low in flocking toward other people and being talkative and sociable around them. You are about average in generally wanting to be good to other people, including helping them when they need it. There are high chances that you'll try to get along with other people. You're high in believing that other people are generally good and not out to harm you. You're extremely low in sticking to your word, keeping your promises, and upholding your obligations. When you need to do something, you have extremely low ability to get it done and do it well (or maybe more accurately, you believe that your ability is extremely low). Compared with other people, you have extremely high stress, fears, and worries about the future. You have extremely low self-control when it comes to resisting temptations; there are extremely high chances that you'll give into your desires and binge (on shopping, eating, drinking, or whatever your vices are). The chances that you'll be overwhelmed by difficult circumstances are extremely high. Notice that this is different from anxiety (which refers to general stress- and fear-proneness) and self-efficacy (a facet of conscientiousness that reflects your confidence in your ability to accomplish tasks). Vulnerability specifically refers to your propensity to feel overwhelmed by difficult situations. Bored? Take a Big Five test!